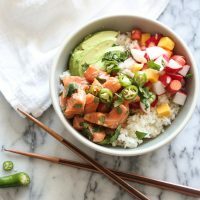 This easy tasty salmon poke bowl recipe is packed with pickled veggies, avocado, and topped with a spicy ponzu sauce. It's a bright, healthy bowl for spring or summer inspired by the classic Hawaiian dish. In a fine mesh sieve, rinse the sushi rice under warm water until it runs clear. Place in a small saucepan with 1 ½ cups water. Allow to sit in the water for 15 minutes. Then bring to a boil, reduce heat to low, cover, and cook for 20 minutes. Remove from the heat and rest for 10 minutes. Then fluff with a fork and divide between 4 bowls. Meanwhile, combine the carrots, radishes, garlic, vinegar, and salt in a medium mixing bowl. Let sit, stirring occasionally, until the vegetables have softened, about 15 minutes. Mix the ingredients for the spicy ponzu sauce together in another small mixing bowl. Add the salmon and cilantro; toss to combine. Divide the salmon, pickled vegetables, and avocado between the bowls, arranging each in its own quadrant. Spoon the remaining ponzu sauce over the poke bowls (or serve on the side), and garnish with black sesame Gomasio, if using. Depending on how spicy you like your sauce, you can add a dash of sriracha as well!